The gobbler was at the top of a small draw strutting his stuff when I caught him in my binoculars—a respectable Idaho Merriam’s. It had been a frustrating weekend of turkey chasing, with stuck trucks, rainstorms, snowstorms and fog. The birds were there and I could get the toms to gobble, but they would then run in the opposite direction when I called. Eventually, I ditched the tried and true techniques of setting up, calling and hooting like an owl. All the stuff the magazines and videos tell you to do went out the window as I went spot and stalk turkey hunting—with my recurve. From the top of a ridge I had a clear field of view of the mountainside below, with birds congregated near a three-fingered draw. My long beard was at the top of one of those fingers, puffed up to three times his normal size and redfaced. As I watched, he dropped below the lip of the ridge. As I slipped into the trees, the squirrels shut up and the birds stopped chirping as if the woods themselves were trying to rat me out to the turkey. But I closed the distance and watched as the bird dropped into one of the finger draws, heading to the thick cover down the hill. I ditched my decoys, binoculars, and camo coat, and ran as fast as I could. My plan was to crest ahead of the gobbler, let him close the distance to me, and then stick him from behind a tree. At first, the plan worked perfectly. I came in ahead of the bird and saw him walking on a game trail. If he stayed on it, he would pass within 15 yards directly downhill from my location—absolutely perfect. 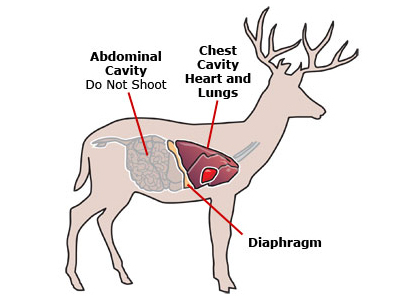 I nocked an arrow and told myself to breathe. The tom stayed on the trail and was in a perfect place when I drew my bow back to shoot. I had the form down, knew the distance, and could feel the shot as the bird walked down the path and I tracked him with my bow. I figured in my lead for the shot and let the arrow go. The shot felt good, but I watched the bird stop dead in its tracks when it heard the sound of my string. The dull “plunk” from my 55-pound longbow definitely sounded out of place in the woods. My lead was six inches too far in front of the gobbler. 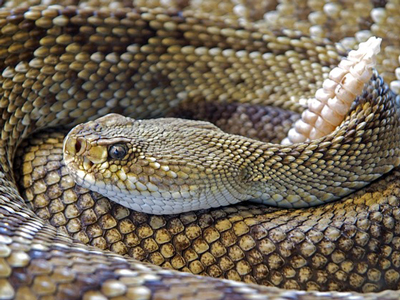 I watched in agony as the tip of my broadhead fluffed the swaying beard of my spot and stalk tom, who took three steps and soared to the bottom of the canyon. It was a painful arrow retrieval and a long walk back to camp. But I’m a chef as well as a hunter, and luckily I have friends with turkey tags too. Here is how I prepared the drumsticks from a jake one of them harvested that same year. I wish I could cook a wild turkey like a butterball at Thanksgiving. But alas, the two birds are not even close to the same thing. The problem with wild turkey is that they actually use their muscles, and that can make the legs so tough they’re inedible. 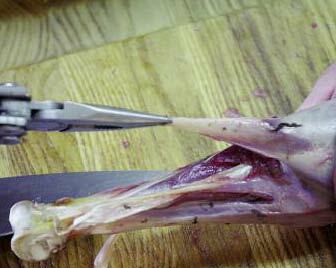 To alleviate the problem of tough drumsticks, I section the bird out, removing the breasts and then the whole legs. Then I break down the leg at the joint into two sections – the thigh and the drumstick. The thigh meat can be a little tough, but not like the drumstick. 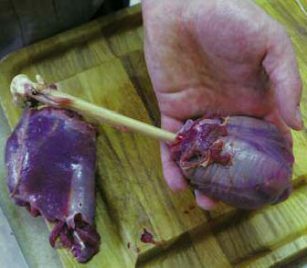 When the tendons are gone most of the bone will be exposed, making it look as if a big bulb of meat is attached to the end. The drumstick is now ready to cook, free of the tough tendons that would have made it inedible. I cook drumsticks like a lamb shank or an osso bucco—long and slow, to dissolve the connective tissue and make the meat tender. Here’s a favorite way to fix them. 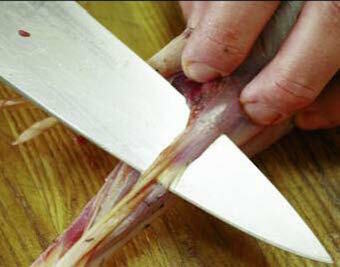 Run a sharp knife down the bone to expose most of the tendons. 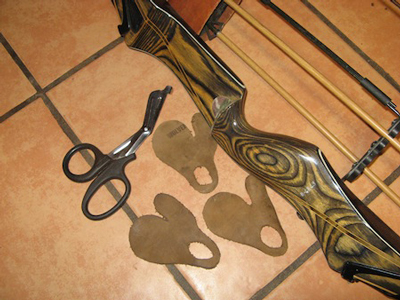 Use pliers to pull out as many of the tendons as possible. The finished drumstick is now ready to cook. In a medium sized sauté pan that will hold the drumsticks and allow a lid, melt butter over medium heat. Brown the drumsticks in the butter on each side for 3-4 minutes. Next, add the onion and pepper and sauté for two more minutes. Then add the curry paste, coconut milk, curry powder, garlic, chicken stock, and lime. Bring the pan to a simmer and cover. Let simmer on low stovetop heat (or in 250-degree oven) for 2 hours. The slow cooking will make the meat moist and tender. 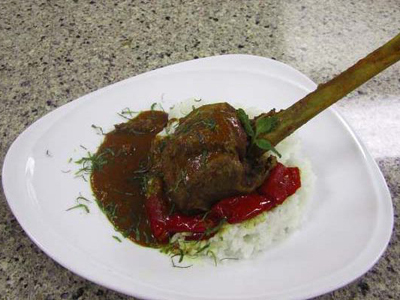 When the drumsticks are tender, remove from the pan and place on a bed of white rice. Then reduce the remaining juices until slightly thickened and serve over the drumsticks. 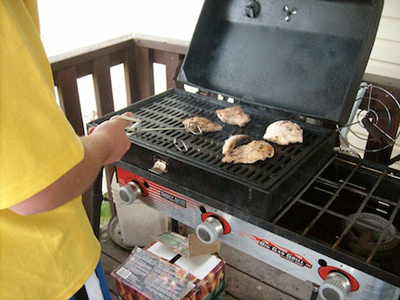 Randy King is a professional chef and traditional bowhunter who lives in Nampa, Idaho. For more of his recipes, visit www.chefrandyking.com. A lifelong outdoorsman and experienced professional cook, CHEF IN THE WILD author Randy King offers a comprehensive primer for the hunter and fisherman wondering what to do with his or her harvest. King recounts his adventures in the mountains and rivers of the West (and the pond and field near his home) in humorous and thoughtful essays providing helpful information on the cleaning, storing, preparation and cooking of wild game. From simple roasted chukar, to pheasant noodle soup, to barbecue bear ribs, CHEF IN THE WILD provides insight and inspiration to both new and experienced hunters - as well as practiced cooks and those less confident in the kitchen. You can find his book at Amazon.com.